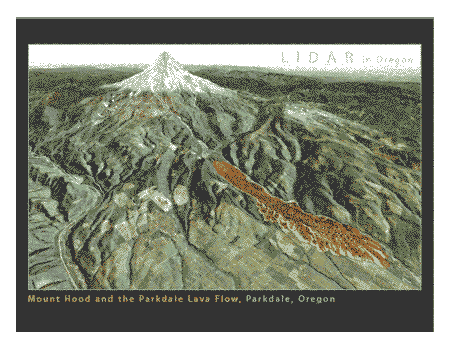 The new LIDAR data viewer created by Oregon’s Department of Geology and Mineral Industries (DOGAMI) offers a fascinating new look at familiar features in the Mount Hood region. This article focuses on the Parkdale Lava Flow, one of the formations where LIDAR offers an especially striking new look at the geologic story. 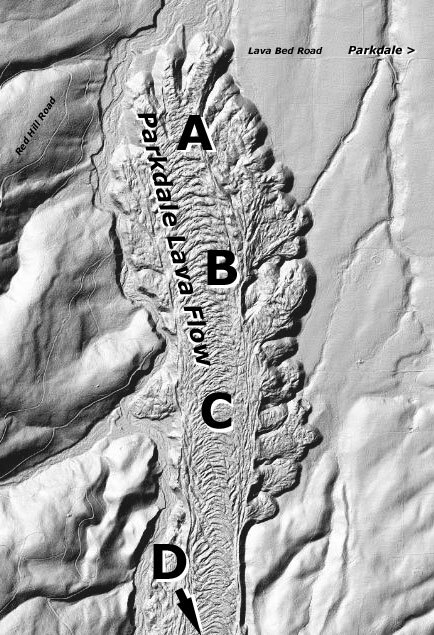 Four sections of the Parkdale flow (shown on the index map, below) are the focus of the article. The Parkdale lava is of the A’a’ variety (pronounced “ah-ah”), characterized by a thick, pasty molten core carrying hardened chunks of cooled lava on its surface like a crusty skin. This floating skin of jagged, solidified rocks echoes the movement of the underlying flow, thus creating the flow lines. 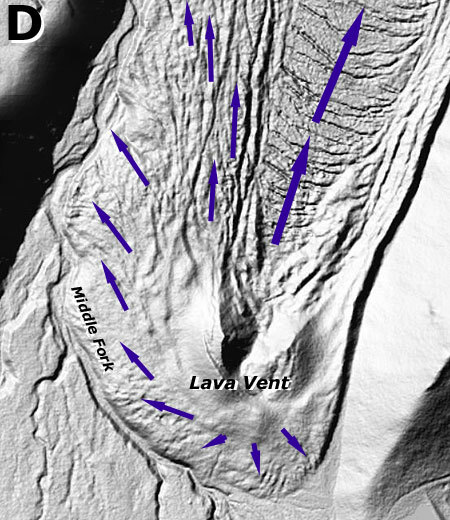 The LIDAR imagery beautifully illustrates these characteristics of an A’a’ flow, including the tall, steep edges of the flow that result from this dense, slow-moving form of lava. 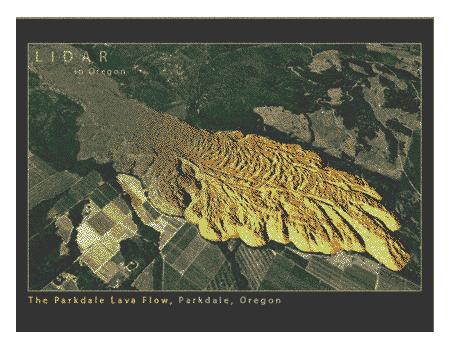 Starting on the north end, at the toe of the Parkdale flow (Map A, below), the LIDAR imagery reveals the flow lines in the once-molten rock in great detail, when compared to traditional maps and air photos. 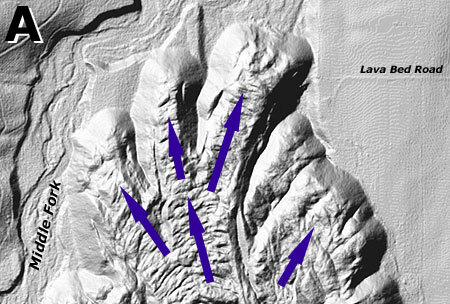 Though the flow was generally heading downhill (the underlying valley floor drops about 250 feet per mile in this area), LIDAR shows it was spreading out, too, as evidenced in the many secondary lobes that formed at the terminus of the flow. The gentle slope of the open valley floor was responsible for the broad toe of the lava flow, which spread out in the shape of a hand (or paw?) once it emerged from the confining canyon walls of the Middle Fork canyon. In this lowest extent of the flow, it’s also clear that the lava covered most of the Middle Fork flood plain. 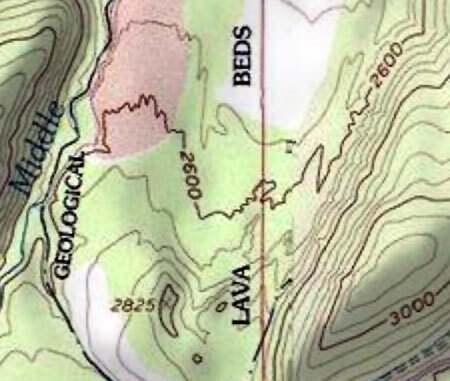 Below the flow, the flood area averages about one-third mile in width, but where the channel along the west side of the lava flow, it measures only a out one-tenth of a mile in width. 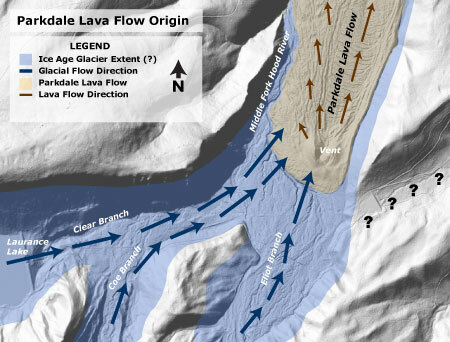 Moving south to the middle of the Parkdale flow (Map B, below), the LIDAR image shows a powerful, quarter-mile wide stream of lava pushing down a channel at the center of the flow. This main channel also has well defined levees of solidified lava along its margins, a common feature on the more liquid Pahoehoe (pronounced pa-HOI-hoi) form of lava, but less so with the viscous A’a’ lava that makes up the Parkdale formation. More on that point, below. This view also shows the first lateral lobes, splitting off the main flow as the molten lava reached the open floor of the Upper Hood River Valley, and where the volume of lava overtopped or burst through the levees along the main channel. The view in Map B, above, also shows how the Parkdale flow pushed the Middle Fork Hood River against the foot of Blue Ridge, to the west. The oversteepened slopes along the west margin of the stream (shown as a distinct shadow) are the result of the Middle Fork continuing to cut away at the base of Blue Ridge, some 7,000 years after the lava flow formed. 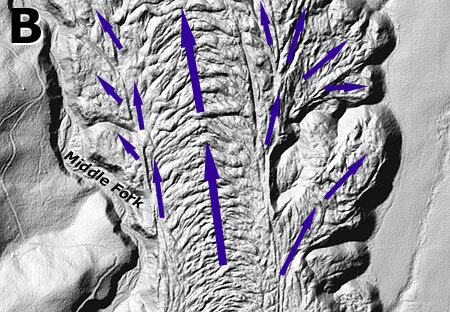 Another view of the mid-section of the Parkdale flow (Map C, below) shows fascinating features along the west margin of the formation. Here, a lobe of lava pushed laterally (left) and uphill into the side canyon of Bear Creek, permanently diverting the Middle Fork Hood River in the process. Molten lava on this scale would have instantly vaporized the Middle Fork as it flowed down valley. But LIDAR shows terraces in stream sediments along Bear Creek near the base of this lobe, suggesting that for some period after the lava cooled, the Middle Fork was backed up, forming a lake. 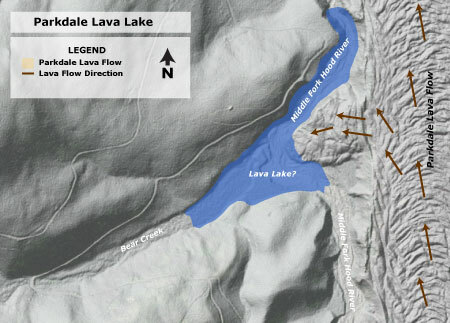 The map below shows what a lake might have looked like, assuming a lava dam formed downstream where the main flow pushed the river high against the slopes of Blue Ridge, creating a 150-foot dam. The resulting lake might have covered 40 acres and been more than 100 feet deep. The terraces in sediments along Bear Creek suggest the lake existed long enough for a few feet of debris to collect before the Middle Fork cut a path around the lava dam, and allowed Bear Creek to cut through the new layer of sediments. Did a lava dam create an ancient lake at Bear Creek? The new LIDAR imagery is most interesting at the south end of the Parkdale flow (Map D, below), at the source of the lava. The LIDAR images clearly confirm a single, crescent-shaped volcanic dome that has long been suggested by surveyed contours on USGS topographic maps. This area is now mostly forested, so the detail provided by LIDAR is the first good look at the radial spread of volcanic material from the vent, initially as more of a mound or cone. As the scale of the eruption grew, a massive stream of molten rock emerged from the north flank of the vent, and began to flow north and downhill, following the broad Middle Fork valley. The eruption must have been a spectacular event, likely setting off forest fires and impressive steam explosions as the Middle Fork was pushed from its riverbed. It was almost certainly witnessed by Indians living along the Columbia River at the time — perhaps from somewhere in the Hood River Valley, even? It would have been a startling sight, especially at night, and could have lasted from a few days to a few weeks. The LIDAR images of the vent area also make it easier to imagine the mechanics of the main lava flow. 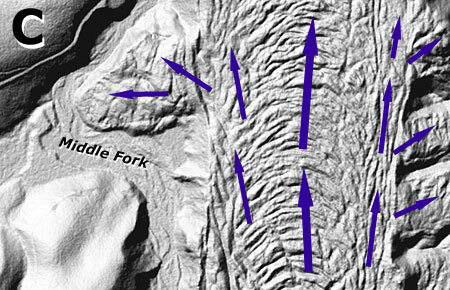 The flow lines on this portion of the flow curve upstream near the vent, as opposed to downstream for most of the flow, a pattern supported by elevation contours: in other words, the upper portion of the flow is concave, or slightly sunken, while the lower flow is convex, or arched upward. This pattern results from the upper part of the flow deflating as the supply of new lava from the vent subsided, and some of the molten core of the lava flow drained back into the vent, while the rest continued to move downhill under the partially solidified skin. Thus, the upper part of the flow flattened out like a deflated balloon, reversing the flow lines in this section as the skin of solidified lava pulled backward against the hardened levees at the edge of the flow. The effect can be seen in the thickness of the flow: at the toe, the bulging lava flow is upwards of 200 feet thick, whereas the sagging upper portions are less than 100 feet thick near the source. An analogy for this phenomenon is to half-fill a tube-shaped balloon with water, lay it on a plank, then gradually lift one end of the plank. The effect would be a pooling of water and rounding of the balloon at the low end, and a flattened balloon at the high end. This is how the flow dynamics of the Parkdale Lava Flow unfolded 7,000 years ago. As mentioned earlier, the main flow channel of the Parkdale Lava flow has many lateral levees of hardened rock that are more typical of Pahoehoe lava, and yet the rock that makes up the Parkdale flow is clearly of the A’a’ variety. Why was this A’a’ flow comparatively liquid compared to nearby lava flows at Mt. Adams and Indian Heaven, for example? One reason is suggested in a recent Oregon State University study that shows Mount Hood to have a less explosive personality than most of the other volcano giants of the Cascade Range. Scientists now believe that regular mixing of magma inside the volcano produces a less viscous, less explosive lava than most of Mount Hood’s volcanic neighbors. This research might explain the fluidity of the Parkdale flow, as well. 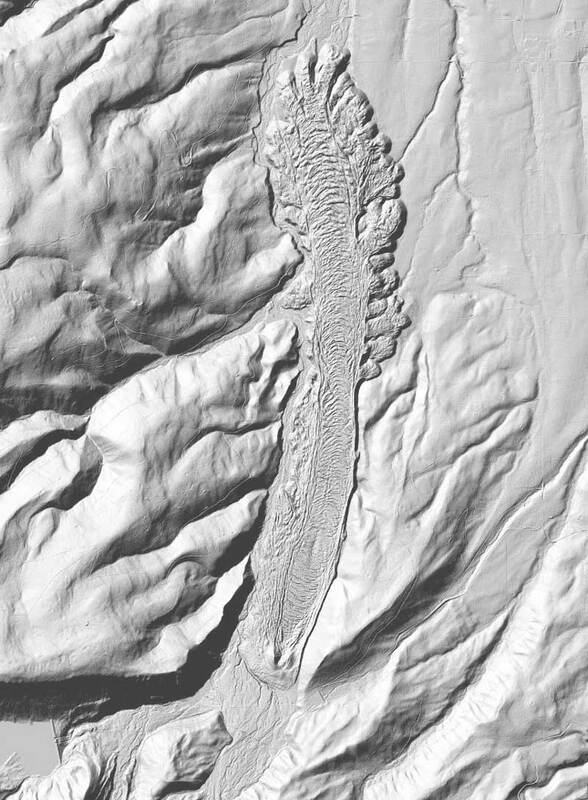 The new LIDAR images of the Parkdale flow beautifully illustrate how the eruption filled the broad glacial valley of the Middle Fork Hood River from edge-to-edge with lava. Because scientists have dated the flow to about 7,000 years ago, it clearly formed after the end of the Fraser Era glaciation, which ended about 10,000 years ago. This means the Parkdale flow most likely erupted in the U-shaped valley left behind by the ancestral Coe glacier — a once massive river of ice that included arms reaching into the Eliot Branch, Pinnacle Creek and Clear Branch valleys, as well as the Coe Branch valley, proper. Though intriguing to imagine a volcanic event emerging beneath an ice-age glacier, the glaciers at the time of the Parkdale flow were more like the modern versions we see today on the north face of Mount Hood, high above their ice age extent. Fire and ice… but not at the same time. Though fire and ice did not co-exist here, the path left by ice age glaciers clearly shaped the Parkdale flow. 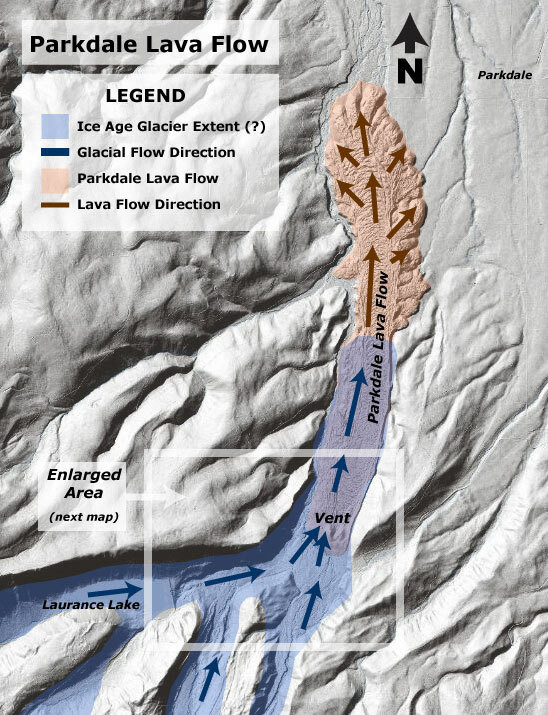 The full extent of the ancestral Coe Glacier is difficult to estimate, partly because the Parkdale Flow has covered the floor of the valley created by the glacier. But the long, straight path of the Parkdale flow clearly follows flat, even terrain that is the hallmark of a glacial valley. Another possibility is that the formation of the glacial valley, itself, might have triggered a lava eruption after the ice retreated, having carved a low spot where underlying magma could find its way to the surface. That could help explain the flow emerging from this spot on the mountain, far from the active volcanic vents on Mount Hood. Fire, ice and more than coincidence that a volcanic vent emerged here? Equally puzzling in this area is the gap leading to the Evans Creek drainage (marked with “?” on the map, above), which has all the features of a glacial valley, but is separated by a low, 150-foot high saddle from the main Middle Fork valley. 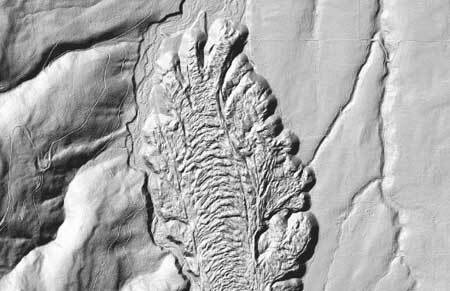 Hopefully, the LIDAR imagery will help geoscientists untangle the mystery of these landforms. To purchase these beautiful images, go to the DOGAMI website, and select from the posters and postcards. To surf the LIDAR imagery yourself, go to the DOGAMI website, and launch the LIDAR Viewer.